'Bells of Ireland' are flowers to please anyone who loves flower arranging. Cut fresh, the bells will last for years and they are very useful for winter arrangements but they also look good in flower borders and with the recent fashion for green blooms are becoming more sort after. The papery 2 to 5cm (¾ to 1¼in) bells are densely packed along most of the length of the square stems that can reach up to 90cm (3in). The white flowers are relatively small and inconspicuous but the green, bell-shaped calyx surrounding each bloom is large and showy. The bells are as wide as your thumb and crowd their way up the entire stem. The large white seeds are produced at the bottom of the calyx, looking somewhat like chicken eggs in a nest, so it’s sometimes called Shell flower. Moluccella look good when combined with other colourful annual flowers in the border or cutting bed. They also do well in containers, offering a vertical component. 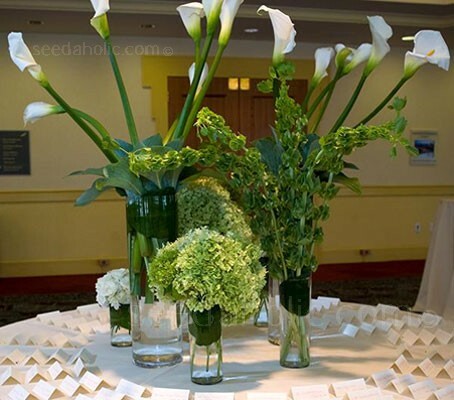 The light green colour complements any white flowers or purple-leaved plants and can be used in monochromatic schemes with other green-flowered plants. They even look interesting late in the season when the old spikes become dry and bleached (if they haven't been pruned out to encourage new growth). Sowing: Sow indoors in Spring. To hasten germination, prechill the seeds for 5 days. Place the seeds in a moistened piece of kitchen roll and place in the fridge for 5 days. Sow seed on the surface of lightly firmed well drained seed compost in pots or trays. “Just cover” the seed with a light sprinkling of compost or vermiculite, do not exclude light as this helps germination Keep at a temperature of around 15 to 20°C (59 to 68°F). After sowing, keep the surface of the compost moist but not waterlogged; germination can take between 21 to 35 days. When large enough to handle, transplant seedlings into 7.5cm (3in) pots or trays and grow on. Gradually acclimatise to outdoor conditions for 10 to 15 days before planting out after all risk of frost, 22 to 30cm (9 to 12in) apart. For best results site in a well drained position in full sun. The flowers take around 90 to 100 days from seed to bloom. The stems should not need staking unless the area is exposed and subject to high winds. This is a fast-growing border plant with unusual qualities including an ability to survive for months as a cut flower. 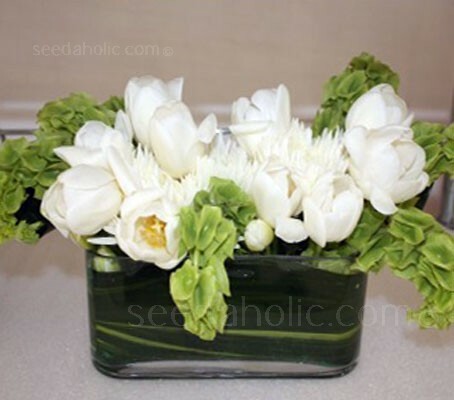 To use for fresh arrangements, harvest the flower heads at their peak of blooming. The stems are hollow making them difficult to use with Oasis foam. 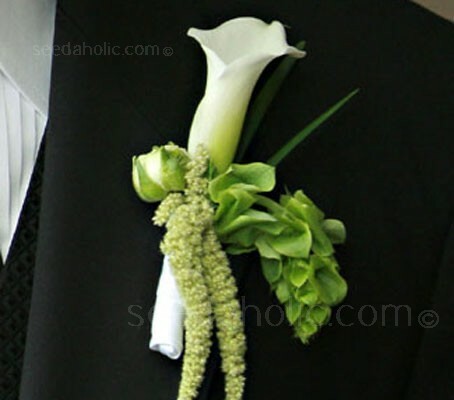 Professional florists insert a wired stake into the hollow stem for use in foam. Display in a cool, shaded area and kept supplied with fresh water, they will remain fresh for 7 to 10 days. Re-cut 12mm (½in) from the base of each Bells of Ireland stem under water using a sharp knife with each water change to extend the life of the blooms. Remove any foliage that may become submerged after re-cutting to avoid bacterial growth. Adding a commercial floral preservative to the vase will help to prevent bacteria growth and feeds your flowers insuring a longer vase life. To make your own cut flower food, mix half a teaspoon of table sugar to a quart of cold water and mix thoroughly. Bells of Ireland turn a lovely straw colour when dried. Harvest the flowers in dry weather at the end of the summer. Hang upside down in a dry area, making sure that there is enough ventilation between the flowers, so that they dry evenly. Despite its name, Bells of Ireland is actually a native of Syria and Turkey. 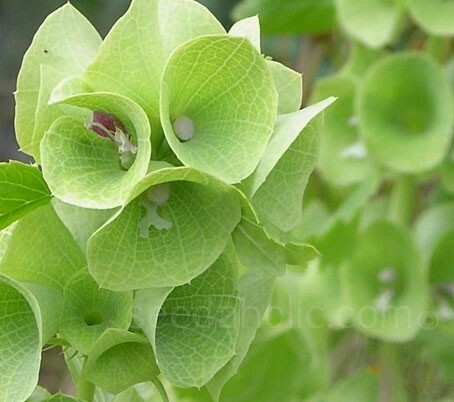 The genus name is spelt as Molucella or as Moluccella, both are equally used. It is said to be named for the Molucca Islands of Indonesia. It may have been mistakenly thought of to be the origin of this plant. It is presumed to be from an Arabic word meaning "King" or a diminutive of Molucca." The species name laevis means smooth, free from hairs or roughness. They have have a distinctive lemon/vanilla scent. © 2018 Seedaholic. All Rights Reserved.